Removable dividers to customize compartment sizes. Innovative locking latches and carriage of 3 at once saves time; stacking option allows secured stacking of several organizers to save space and maintain organization; removable dividers provide high customization for small parts and larger hand tools; unique 90 degree angle in the main compartment design allows storage of hammers and angled tools or tape measures comfortably together with the small parts in the other nearby compartments; special lid structure - upper lid interlocking with dividers - prevents movement of small parts from one compartment to another. Features removable dividers for inner customization; carry handle for easy portability; unique lid design keeps small parts from moving between compartments. Heavy duty transparent polycarbonate lid and side latches enable stacking to other PRO organizers. 22 pound load capacity; side katches allow connectivity for easy carrying and safe stacking; removable compartments for small parts and accessories and once removed for power tool and charger; clear and impact resistant unique lid design locks all compartments in place; full visibility for quick access; built-in wide handle for easy and stable portability and metal hinges and latches. Constructed with impact resistant materials for jobsite durability and features an IP65 rated weather seal to keep out rain and jobsite debris. Part of the "ToughSystem" line - can also be stacked with other "ToughSystem" modules; durable, thick structural foam walls; large open interior for bulk storage; internal slots for inserting dividers for organization of space. Heavy-duty weather & dent resistant aluminum construction. Reinforced frame and corners for added strength. Padded dividers and removable 17 pocket tool holder. Applications: Ideal for tools, hobbies and crafts, cameras and more. 2 Keyed Locks for security. FatMax Professional Organizer, 16 in Width, 19 in Depth, 4 in Height, Aluminum, Crystal Clear Lid, 5.72 lb Weight Features durable and thick structural foam walls, integrated water seal and rust-resistant metal latches. Storage pockets on the lid and 4 removable cups allow for storing small parts and side latches allow the product to be stacked to the other modules of the "ToughSystem" storage line. Clear lid made of polycarbonate for resistance and full content visibility; includes 4 large and 8 small removable cups; stacking side latches allow attaching additional organizers or other "ToughSystem" modules; fits "ToughSystem" Metal Carrier DWST08210 and can be secured by its central locking mechanism; durable structural foam box walls give robust structure; integrated water seal for protection from the environment (IP65); robust anti-rust metal latches. Constructed with impact resistant materials for jobsite durability and features an IP65 rated weather seal to keep out rain and jobsite debris. The interior features 10 removable bins that can be mounted onto common jobsite materials for easy access and no-travel bins seals to prevent the bins contents from migrating between bins during transport. Compatible with all "ToughSystem" modules; robust racking solution can load up to 440 lbs. Cost and space efficient; clear lid made of polycarbonate for resistance and full content visibility; includes 4 large and 8 small removable cups; stacking side latches allow attaching additional organizers or other "ToughSystem" modules; fits "ToughSystem" Metal Carrier DWST08210 and can be secured by its central locking mechanism. Includes "ToughSystem" Workshop Racking system amd "ToughSystem" Organizer (sku # 752.3277). 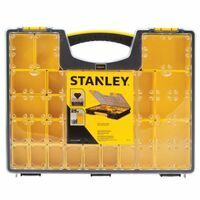 Solid steel, heavy-duty construction; unit is equipped with 118 of the most commonly used tools and accessories in custom formed tool specific organizers for ultimate storage and quick access; tool kit includes: Hex Key wrenches; 12 oz. Claw Hammer; 10' Measuring tape; 6" Long nose pliers; 9" Torpedo level; Twist drills; Masonry bits; Wood working drills; 8" Adjustable wrench; Screwdrivers; Magnetic Bit holder; Ratchet wrenches: 1/4", 3/8" and 1/2"; 3/8" Spark plug sockets; 2 Extension bars; Drive sockets: 1/4", 3/8" and 1/2"; Screwdriver bits: 25mm and 50mm; 18mm Zinc Alloy Knife; 10" Groove Joint pliers and 6" Lock Grip pliers; Ball bearings keep the drawers operating smoothly and minimizes wear and tear. Integrated power and USB on chest can charge power tools, batteries and electronics. 100 pound ball-bearing drawers with soft close latching for smooth and quiet operation. Dewalt? labeled lid stiffener provides extra stability. 18-20 gauge double-wall steel construction is reinforced with internal corner gussets. Under-lid area includes an open front, gas struts and top mat. Heavy-duty keyed locking system safeguards your tools. 7,206 cubic inches of storage. Constructed of double-wall steel for strength and durability. It has six 100-pound load capacity drawers with soft close latching for smooth and quiet operation. It also has a heavy-duty keyed internal locking system to safeguard tools. Conveniently charge your power tools, batteries and electronics from the side of the cabinet. Its load rating is 1,500 pounds with reinforced mounting channels and it has four 5-inch x 2-inch casters, two of which lock and swivel. A full-grip tubular side handle with a comfortable black overmold is included for ease of mobility. Also included are six Dewalt? embossed drawer liners and one Dewalt? embossed top mat to help protect the cabinet surface. Heavy duty drawer slides with 100 lb capacity; thicker gauge steel body for increased durability; 10-3/8" deep top lid provides enough space to stand up "Dewalt" cordless power tools; auto return drawers keep drawers securely closed while maneuvering around work site; 18" drawer depth and heavy duty casters. Integrated power and USB on chest can charge power tools, batteries and electronics. 18-20 gauge double-wall steel construction is reinforced with internal corner gussets. 100 pound ball-bearing drawers with soft close latching for smooth and quiet operation. Under-lid area includes an open front, gas struts and top mat. Dewalt? labeled lid stiffener provides extra stability. Heavy-duty keyed locking system safeguards your tools. 12,348 cubic inches of storage. Constructed of double-wall steel for strength and durability. Conveniently charge your power tools, batteries and electronics right from the side of the cabinet. It has nine 100-pound load capacity drawers with soft close latching for smooth and quiet operation. It also has a heavy-duty keyed internal locking system to safeguard tools. Has a load rating of 1,500 pounds with reinforced mounting channels and has four 5-inch x 2-inch casters, two of which lock and swivel. A full-grip tubular side handle with a comfortable black overmold is included for ease of mobility. Also included are nine Dewalt? embossed drawer liners and one Dewalt? embossed top mat to help protect the cabinet surface.